1. All manuscripts must be in MS Word format and should be submitted via our online submission system. Authors are encouraged to use the manuscript template provided in our website to prepare their manuscripts. Title page and rest of the manuscrip should be uploaded on seperate pages to the system. Title page must contain the title in English and/or Turkish, authors and affilations. Corresponding author name,affilation, adress, e-mail and telephone number must also be included. The manuscript must be consist of title, abstract, özet and the rest of the manuscript. 2. The manuscript should be prepared as a single file including Title, Abstract, Key Words, Abstact and Keywords in Turkish, Main Text, Acknowledgements, References, Figures, Schemas and Tables. The full names and the addresses of all authors, in addition, e-mail address and telephone number of the corresponding author must be provided with the cover letter only. Authors should indicate their names and addresses with the cover letter but not with the manuscript. "This manuscript has not been previously published in another language anywhere and that it is not under simultaneous consideration by another journal." Authors may submit the names, affiliations and addresses (including e-mail) of at least three expert reviewers or those they do not want to review their papers. 5. Authors would be required to sign a transferring copyright form which will be supplied by the Editor, to our journal after the manuscript is accepted for publication. 6. Authors using experimental animals and human subjects in their investigation must seek approval from the appropriate Ethical Committee in accordance with "Principles of Laboratory Animal Care" (NIH publication no. 85-23, revised 1985) and/or the declaration of Helsinki promulgated in 1964 as amended in 1996. The method section must include a statement to prove that Ethical aspects of the investigation was approved and that informed consent was obtained. 1. Manuscripts must be neatly typed with “Times New Roman 12 pt” (size page A4), double-spaced throughout, including figures and tables, with 2.5 cm margins on all sides. 2. The Editor reserves the right to adjust style to certain standards of uniformity. Every page of the manuscript must be numbered at the right top. 3. Titles and subtitles should be written bold and title case. 4. The usage of italics should be limited to scientific names of organisms. Manuscripts should be prepared according to the below mentioned word and reference limitations and other related information. 1. Manuscript should include adequate information for reproducibility by specialists. 2. First page should contain Title, Abstract-Key Words in English, and Abstract -Keywords in Turkish. 3. The title should not include abbreviations except well known abbreviations such as HPLC, DNA, etc. The title should not exceed 15 words, the English and Turkish abstracts should not exceed 200 words, and upto 5 keywords should be provided. 4. The full names and addresses of all authors, in addition, e-mail address and telephone number of the corresponding author must be provided with the cover letter only. 5. Second page should start with the Introduction. The other sections should be Materials and Methods, Results and Discussion, Conclusion, Acknowledgements (if necessary) and References. 6. Figures and Tables must be presented after they are mentioned in the text. 7. Sections ranging from the Introduction to the Conclusions should be numbered with Arabic numerals such as 1, 2, etc. Sub-headings should also be numbered with Arabic numerals such as 1.1, 1.2, 2.1, 2.2, etc. All pages should be numbered consecutively, the title page being p.1. 8. For research articles, main text (excluding references) should not exceed 5000 words, and number of references should not exceed 40. 1. Highly focused review articles written by experts on the relevant subjects will be published. 2. First page should contain Title, Abstract-Key Words in English, and Abstact -Keywords in Turkish. 3. The title should not include abbreviations except some well known abbreviations such as HPLC, DNA, etc. The title should not exceed 15 words, and the English and Turkish abstracts should not exceed 200 words, and upto 5 keywords should be provided. 5. Figures and Tables must be presented after they are mentioned in the text. 6. Sections ranging from the Introduction to the Conclusions should be numbered with Arabic numerals such as 1, 2, etc. Sub-headings should also be numbered with Arabic numerals such as 1.1, 1.2, 2.1, 2.2, etc. All pages should be numbered consecutively, the title page being p.1. 7. A review article should consists of Introduction, relevant headings/subheadings and Conclusion sections. All headings and subheadings should be numbered with Arabic numerals as described in Research Articles section. For the review articles, main text should not exceed 6000 words. There is no limitation for number of references. References should conform to the following styles. 1. Williams H, Ward J, Egger M, Neuner R, Brooks R, Clegg D, Field E, Skosey J, Alarcon G, Willkens R: Comparison of naproxen and acetaminophen in a two-year study of treatment of osteoarthritis of the knee. Arthritis and Rheumatism 1993, 36(9):1196-1206. 2. Karidas T, Avgerinos A, Malamataris S: Extractionless HPLC method for the determination of naproxen in human plasma and urine. Analytical Letters 1993, 26(11):2341-2348. 3. Zakeri-Milani P, Barzegar-Jalali M, Tajerzadeh H, Azarmi Y, Valizadeh H: Simultaneous determination of naproxen, ketoprofen and phenol red in samples from rat intestinal permeability studies: HPLC method development and validation. Journal of Pharmaceutical and Biomedical Analysis 2005, 39(3):624-630. 4. Parthasarathi G, Nyfort-Hansen K, Nahata MC: A Text Book of Clinical Pharmacy Practice. Essential Concepts and Skills: Orient Blackswan; Longman, India, 2004. 5. Ohannesian L, Streeter A: Handbook of Pharmaceutical Analysis. CRC Press; Boca Raton, Florida, 2001. 6. Lunn G: HPLC Methods for Recently Approved Pharmaceuticals. John Wiley & Sons; New York, USA, 2005. 7. Lee VH. Ocular epithelial models. In: Borchardt RT (eds), Models for Assessing Drug Absorption and Metabolism. Springer; Berlin, Germany. 1996: pp 425-436. 8. Krause N, Hoffmann‐Röder A. Allenic Natural Products And Pharmaceuticals. In: Krause N (eds), Modern Allene Chemistry, Willey VCH; Weinheim, Germany. 2004: pp 997-1040. 9. Celebier M, Altinoz S, Electrochemical behavior investigation and electroanalytical method development for Olmesartan Medoxomil. 8th International Electrochemistry Meeting; October 08‐11, 2009; Antalya-Turkey. 10. Kaya E, Brown P, Bregman A, An overview on HPLC analysis of Naproxen sodium. 17thInternational Pharmaceutical Technology Symposium; September 8 - 10, 2014; Antalya-Turkey. 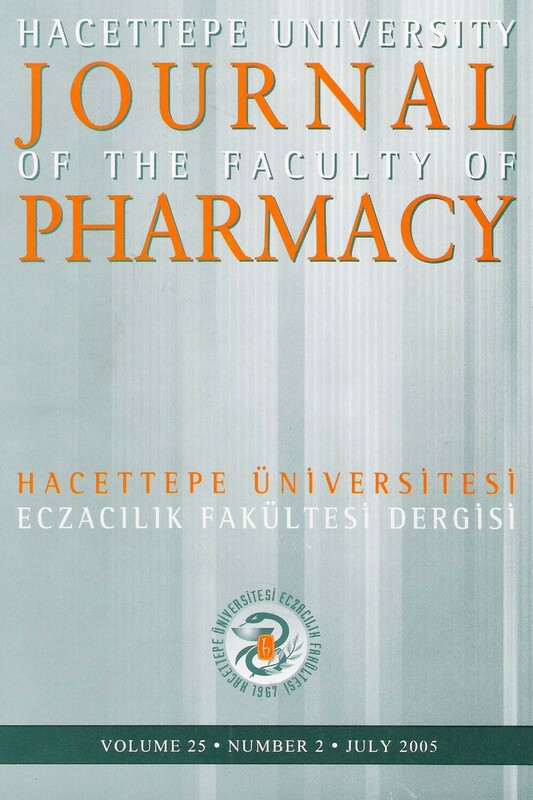 Hacettepe Journal of the Faculty of Pharmacy does not recommend to use the websites as a reference unless it is really necessary. 1- Use only SI quantities and units (SI = Système International d’Unités). All nomenclature should follow established rules wherever these are available. 2- Only generic and chemical names of drugs should be used, although a proprietary equivalent may be indicated once, in parentheses. Pharmacological and Chemical Synonyms, E.E.J. Marler, 9th edn. (Elsevier, Amsterdam, 1990) may be consulted. 3- The nomenclature of chemical substances should be consistent, clear and unambiguous, and should conform to the usage of the American Chemical Society and the convention recommended by the International Union of Pure and Applied Chemistry (IUPAC). When in doubt, writers should consult the indexes of Chemical Abstracts; the various reports and pamphlets of the American Chemical Society Committee on Nomenclature, Spelling and Pronunciation; and from the International Union of Biochemistry and Molecular Biology (IUBMB): Biochemical Nomenclature and Related Documents (Portland Press, London). 4- The trivial name of the enzyme may be used in the text, but the systematic name and classification number according to Enzyme Nomenclature, rev. edn. (Academic Press, New York, NY, 1984) should be quoted for the first time the enzyme is mentioned. routes of drug administration i.v., i.p., s.c., i.m. Mathematical equations should be drawn or written in the manuscript at the appropriate places where they belong. They should always stand alone (i. e. occupy extra lines). Revised manuscripts should be returned as follows. A revised text file with all alterations are clearly marked and visible should be submitted. Use either (1) the track change mode in Microsoft Word or (2) change the script color of areas containing the required alterations. The manuscript should be accompanied by a point by point letter summarizing how you have dealt with each of the reviewers’ remarks. The file(s) with the changes visible on screen should be submitted to the online procedure. Upon acceptance of the manuscript the final uploaded version will be taken as the basis for copyediting and the subsequent production process. Please carefully go through the following check list. Non-compliance with Hacettepe University Journal of the Faculty of Pharmacy manuscript formatting requirements will result in the manuscript being returned to the corresponding author for reformatting or rejection. [ ] Is the manuscript typed double-spaced with 2.5 cm of margins from all sides on A4 (MS Word 2003 or newer version) including all the sections? .Note that PDF is not acceptable. [ ] Are the authors’ full names and abbreviations given in ‘Cover Letter’ but not in manuscript? [ ] Are the Abstracts (English and Turkish) written within the 200-word limit and 5 keywords provided? [ ] Is the manuscript within the limit of 5000 words (typed double-spaced on A4) for research papers or 6000 words (typed double-spaced on A4) for review papers? [ ] Does the ‘References' list adhere strictly to HUJFP format? [ ] Are the Figures/images sharp and clear with legible fonts of at least font 12 for y- and x-axis labels, units and annotations? [ ] Are the orders removed around the Figures? [ ] Are Figures and Tables inserted at appropriate places in the manuscript nearest to where reference was made to them? [ ] Are the expert reviewers (at least three) provided?